When it comes to piglets, many of us imagine these animals in enclosures where they only gain weight for more earnings of owners. This was also the way a pig in the video before you lived, but then some good people came to aid and saved six piglets together with her. The pig was just before the cruel fate together with the piglets, as they were already taken to the slaughterhouse of a local butcher. Luckly, there her life was saved by good people who bought the pig with her piglets from the butcher. Instead of a cruel fate, the pig has experienced something that she certainly dreamed of all her life! Together with the piglets, she was taken to a property where she will survive the rest of her life. There is no danger to her, as the new owners are convinced that also pigs deserve a decent life, which they will be able to enjoy. 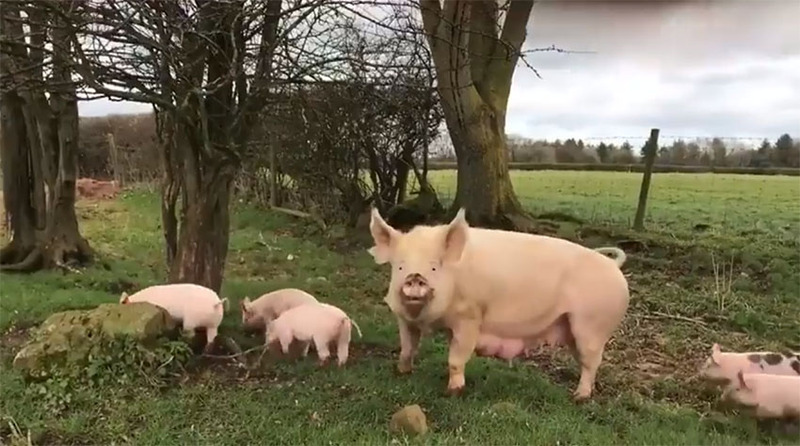 When you see how pleased she was together with her piglets at the new home, you will be delighted with the video yourself too!